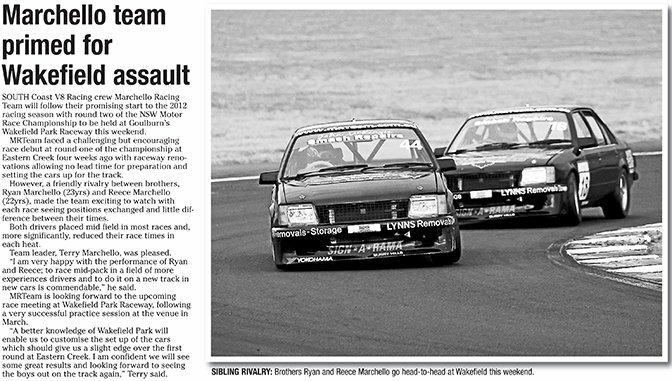 SOUTH Coast V8 Racing crew Marchello Racing Team will follow their promising start to the 2012 racing season with round two of the NSW Motor Race Championship to be held at Goulburn’s Wakefield Park Raceway this weekend. MRTeam faced a challenging but encouraging race debut at round one of the championship at Eastern Creek four weeks ago with raceway renovations allowing no lead time for preparation and setting the cars up for the track. However, a friendly rivalry between brothers, Ryan Marchello (23yrs) and Reece Marchello (22yrs), made the team exciting to watch with each race seeing positions exchanged and little difference between their times. Both drivers placed mid field in most races and, more significantly, reduced their race times in each heat. Team leader, Terry Marchello, was pleased. “I am very happy with the performance of Ryan and Reece; to race mid-pack in a field of more experiences drivers and to do it on a new track in new cars is commendable,” he said. MRTeam is looking forward to the upcoming race meeting at Wakefield Park Raceway, following a very successful practice session at the venue in March. “A better knowledge of Wakefield Park will enable us to customise the set up of the cars which should give us a slight edge over the first round at Eastern Creek. I am confident we will see some great results and looking forward to seeing the boys out on the track again,” Terry said.